What seemed like never-ending snow has now turned into drenching April showers. It is indeed nice to get a break from the insanely cold weather. Looks like spring just might be on its way. I must say, Indiana weather has really thrown me for a loop. When I was little, I used to love to jump in puddles and get wet and see the splashing water. Yet, this morning I was dodging puddles trying to get to the bus stop sign as the rain poured, the wind howled, and the thunder and lightening kept breaking above me. My umbrella was fairly useless, and despite my efforts, I was drenched by the time I got to the bus stop. I then realized that I was standing next to a sign that was the tallest thing in the closest vicinity. I took one step away from it instinctively while realizing that it would probably do very little good if it was actually struck by lightning, so I just started praying that I’d be spared and that the bus would hurry up and arrive. A few other drenched students joined me as we waited shivering hoping the bus would come. Finally, it came and we all scrambled in squeaking and slipping about as we did to begin quite a wet day at school. It didn’t seem like morning. 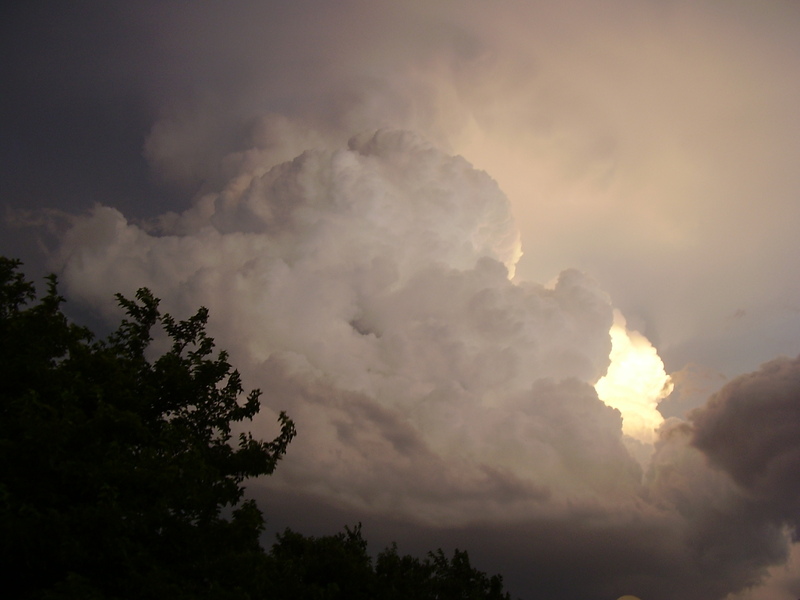 It seemed more like evening, the clouds were so dark. The rain poured and poured and poured. I wondered how anyone would ever want to dance and sing in this stuff. Gene Kelley’s image went across my mind as I scrambled to try to get to my building on campus after getting off the bus. 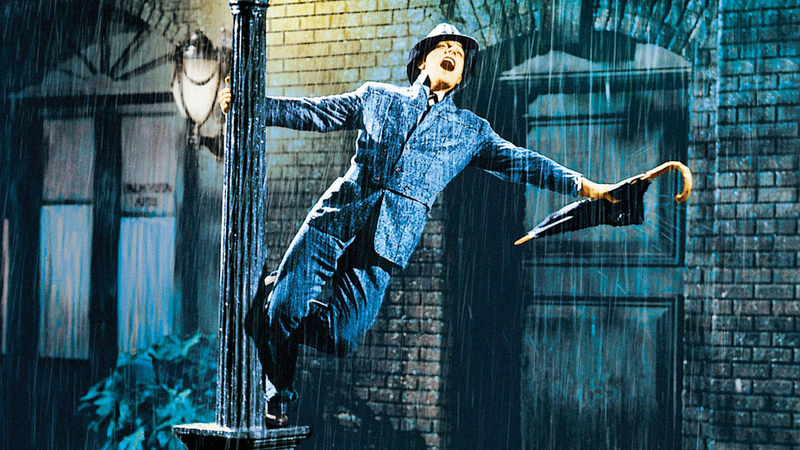 I decided that I wasn’t quite that awake yet or really that excited about the rain to start tap dancing and singing. Most of the students I saw were as equally drenched as myself and looked as equally excited about it. It made for a sleepy sort of day when you wish you didn’t have so many classes and could just go home and drink coffee while staring out the window. But, I suppose, it was one of those character building experiences that makes for a story one can tell later. I later heard from my friends and family in Texas how a lack of rain is causing such a havoc with the drought and the frequent dust storms. Well do I remember what that was like! How truly strange it is. One area of the country is flooding, yet another region is shriveling up because of drought. How and why does that happen? Sure, there’s all sorts of scientific reasons why, but sometimes it’s hard to explain why it continues as it does. Someone in a flooded region surely wishes for drier weather as much as a person in a drought-ravaged region wishes for rain. It can’t be helped. Is that not how life is though? We feel that we need something so badly, and it is obvious how badly we need it. However, instead of getting what we need, we receive more of what we definitely do not need. It’s frustrating and depressing! We wonder if our prayers are going unanswered or are even being heard. The rain keeps pouring without a hope of letting up or the wind keeps blowing with no hope of rain. We feel despair as if maybe we should just throw up our hands and give up, but we musn’t give in to that temptation. Isn’t that why we have fear? We’ve found ourselves in situations and circumstances that we have no control over. Maybe it’s news that has turned our world upside down. We may find ourselves jobless or financially unstable. A loved one may be suffering through a terrible disease or we may find ourselves facing the uncertainty of an unexpected serious health problem. Whatever we face, we no longer feel in control and we don’t know how to weather the storm. On the bus ride home today, I sat there thinking through all of the names of people I know who are in such storms. I then wondered why. Why is it that when that first horrible piece of news or event hits, that God doesn’t just take it away immediately and make it all better? Why doesn’t He just resolve it right then? Why does He allow the storm to continue to roar and thunder and the rain to pour down when I already feel cold and shaken? ‘Why do the clouds hang low and yet bring no rain?’ the farmer in TX wonders. ‘Is there no end of suffering?’ a tired mother of a sick child in a hospital wonders. These are not easy questions to answer and neither is it necessarily wrong to ask them. How can we be able to reach that place where we see everything crashing down and yet say as Job did “Though he slay me, yet will I trust in him: ” (Job 13:15)? Job was able to endure because he knew as he said in the next verse “He [the Lord] also shall be my salvation” (Job 13:16). He held onto this truth even when he couldn’t feel God’s presence and even as circumstances worsened. Keep me safe ’til the storm passes by. Let me stand in the presence on that bright peaceful shore. …I will trust in thee. The events of yesterday definitely sparked some fear in everyone at the Purdue campus. No one ever desires to get a text from the university warning students, staff, and faculty to “shelter in place” because there has been a shooting reported on campus. When something like this happens, there are facts you do not know and questions begin running through your mind as to what is going on. All you know is what has happened before. I was in the middle of a grad class when we heard the tornado sirens go off and received the text warning of the shooting. Everyone including my professor immediately thought of Virginia Tech as we decided to add another table on top of the table already blocking the door to our classroom. As one of the students and the professor finished stacking the table, someone tried to open our door (most likely someone just trying to get out of the hallway), but it scared all of us grad students enough that the prof decided that it would be a good idea to just sit on the floor until given the all clear. We were all calm as we sat on the cold floor talking about the situation. The professor tried to distract us by talking about what we did this weekend or interesting things that have been happening in daily life. Most of us were on cell phones or laptops letting everyone know we were okay as well as finding out updates as they came in. There was some levity too as we tried to stay upbeat. We weren’t scared so much as just hoping it would end soon and wondering about the chances of a shooter entering our building. We all breathed a sigh of relief as the text and email came out that all was clear and that the university could continue normal operations. Though continuing “normal operations” would be hard to do after such a threat to campus safety. Walking outside of the classroom and the building, I noticed that the campus was eerily quiet. There was a giant crowd of students walking around, but you could see the shaken up look on everyone’s face. Everyone was still whispering while asking classmates if so-and-so was all right or if they’d heard from so-and-so. Obviously returning to “normal operations” wasn’t going to be easy. Even though, as we found out later, it wasn’t an active shooter, fear of what could have happened was taking its toll. No one was thinking about their next class, everyone was thinking about loved ones and safety. 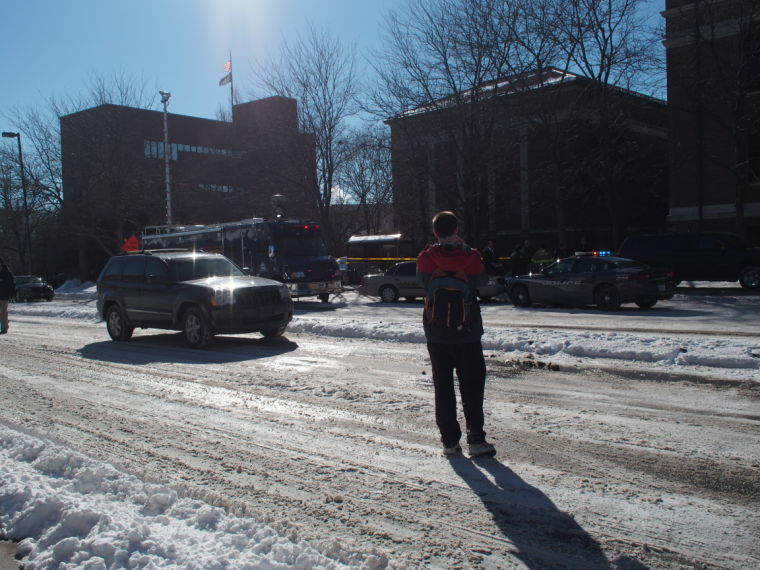 Campus may have been cleared as “safe,” but no one felt “safe”. Personally, I was experiencing a similar feeling of being rather shaken up and just wanting to go home. I had already cancelled one of the classes I teach in the afternoon and thankfully, got permission to also cancel my other class. I didn’t feel like teaching although I would’ve if I had been asked to, I just wanted to go home. Thus, I was glad to be on the bus homeward bound within about 30 minutes of the all clear message. 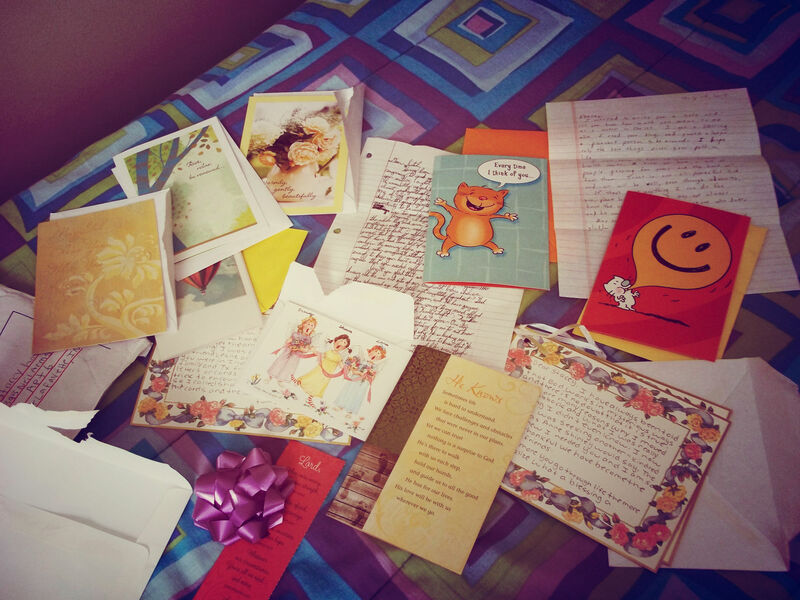 What has been the most amazing to me through the whole thing was the outpouring of love and concern. I posted on Facebook as updates came in. My Facebook pretty much exploded with so many assuring me they were praying, they loved me, and later, that they were thankful that my classmates and I were all safe. My phone also rang most of the afternoon as friends and family called and texted making sure I was okay and offering to listen if I needed to talk it through. I feel for the victim’s family and have been praying for them. I also feel for the entire Purdue community as it will take time to feel safe again on campus. What I am thankful for though is that I have seen the providence and protection of God. I’m thankful for the police who arrived within a couple of minutes of gun shots being fired. I’m thankful that the shooter surrendered to police almost immediately, and that there wasn’t another shooter as many had feared. I’m thankful that an alert was sent out so quickly and that pretty much everyone knew what to do. I’m thankful for the understanding and concern from the university for the mental well-being of its staff, faculty, and students in the aftermath of this in letting us have a day off before continuing classes. I’m thankful as well because this tragedy could have been so much worse than how horrible it already is. God’s angels encampeth ‘Round them that fear Him. We may not behold them, Our vision is dim. Lest I should stumble, Bear me up in your hands. whenever we are afraid because of any circumstance in life, we can truly trust in Him! In an effort to work on a project for Arabic, I decided to write out some ideas to help me plan it. My project was to write a letter in Arabic to my 14-year-old self. The result is this blog post…in English. I assure you, my project didn’t turn out quite this deep or humorous, but it is a nice reprieve from all the craziness to be able to write all this. I know the book you’re reading right now is probably of more fascination to you than this letter, but I thought you might enjoy an update from the future Stacey. Yes, I see you putting down that book and looking up with interest. Before you ask it, no you’re not married, and yes, you’re still in school. Before you slump your shoulders with disappointment, let me explain. In one year, you will begin studying this fascinating language called French. Study it well because it is about to become the main focus of your studies and will basically shape your life and provide you with amazing opportunities. However, it will also annoy you, follow you everywhere, take away your time and sleep, confuse you with its crazy grammar and verb tenses, and yet, you’ll keep coming back to it to learn more and improve. Crazy? I think not! How did this happen? you may ask. Simple: You fell in love…. Then, at age 16 you will find out that you can actually major in that language and you will know what you want to do. I won’t give away everything much like you hate it when Justin (older bro) or Jesse (younger bro) give away the ending of a movie. However, you do get accepted to Texas Tech with a major in French. Don’t look so surprised. You do survive math all the way through Calculus, so no worries on that end and you will love French. You even go off to France for a while at one point. Because I know you! You’re a dreamer! You do build castles in the sky despite how much you claim you don’t. My point in writing is not to discourage you from dreaming. My counsel is that you need to realize that not every dream will come true. However, from the pieces of those broken dreams, you will build and discover new ones that will often exceed the ones you had before. For example, this is a pic of you just two days before you will leave for France for the first time! Exciting, or what!? You see, dreams are important. But, you have to learn how to control them and realize that God is the one who ultimately guides your life. When you recognize His hand in your life, it becomes less of a crushing experience when things don’t work out like you wanted them to. Then, He takes your dreams and your hopes and will show you something even better than you imagined even if you don’t see how it is something better at the time. Yes, disappointing things will happen and your heart will be broken. People will hurt you and let you down because, well, we’re all human. But, even when family or friends hurt you, you must never stop loving them. Yes, it will hurt and life will seem unfair and cruel. However, no matter how much you’re hurt, you cannot let that hurt determine your life. Just as Christian in The Pilgrim’s Progress, you have to keep moving forward ever onward towards the Celestial City. Let the trials and hurts you face help make you a stronger and wiser person! Don’t let the hurt and the disappointment make you into a bitter and unforgiving person. By the way, these people become some of your greatest friends and allies in life. I actually can’t even post pictures of everyone who will have an effect on your life because it would take up so much space. That’s the other thing, I wanted you to know. Life is not all about you. If you think that, you need to take a step back and rethink things. When you realize that life is not all about finding out what makes you happy and what you want to do, but instead how you can help make others happy and help others, that is where you will find true happiness. You will find that a lot your success in life is actually due to others setting aside time and energy to help you. Now, is the time to serve the Lord. Not later! Yes, I may be few years older now, but I still know this to be true. When you ask God to lead you, He will. His answers may seem late or not what you were looking for, but that’s not the point. The point is that you follow where He leads. This is the answer to life’s questions. I am also writing this to myself presently because I am facing some very important decisions that will have an effect on the rest of my life. Who knows? Maybe 10 years from now the older “wiser” Stacey will write a letter to the present me with similar or better advice. Enjoy growing up though realize that even being a grown up isn’t all you think it is. 😉 There’s that little thing called bills and then responsibility, but I won’t get into that. Enjoy life and the journey! Finding the right path to take in life is never really easy. I’m hitting a crossroads right now. I am considering many options and trying to find the right way to go. I can’t say that I have the answer even now. Sometimes life seems like one of those pinball machines I used to play with as a kid. 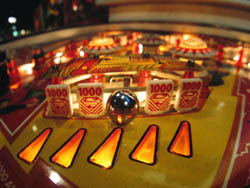 The ball is heading a certain direction until either being hit with one of the paddles or colliding with one of the many obstacles in the machine causing it to completely change its course. Maybe that’s not the best analogy, but I feel like sometimes we think we’re heading in the right direction until we’re hit with an obstacle or a “paddle” that forces us in another direction entirely. I don’t think it’s all left up to fate either. There’s a reason for each obstacle, paddling, and brick wall we meet with. I try to keep this optimistic view, but I’m not unrealistically optimistic. I believe that even when events in life don’t go as planned, it’s for a reason. How boring would a planned life be with no surprises? I know sometimes the things we don’t expect to happen are unpleasant, but sometimes they can also be some of the most wonderful experiences. Someday I’ll look back and perhaps see that there were reasons why some things didn’t work out. On top of these life decisions I need to make, I’ve been lately trapped underneath papers, grading, and stress, and it’s about to get worse, a lot worse. People ask me fairly often when the end of the semester is, I tell them, and their response is along the lines of “Oh, you’re almost through! Just a few more weeks!” I usually give a half a smile in the midst of my caffeine high euphoria and think “That’s precisely the problem”. Just about three weeks to figure out how in the world I’m going to spit out all these papers and projects. In the midst of this there are all the due dates for the applications I’m filling out and a list of things to do before the semester ends. Sometimes it feels like more than I can handle, like I’m getting hit by too many obstacles at once. When I begin to feel this way, it usually means that I need to take a step back and breathe. Somehow I’ll make it through this. Besides, there’s always an adventure or something to laugh about along the way. Yes, I may feel like I’m trapped in a pinball machine, but this is only temporary. Those hits with the paddle and brick walls do typically smart, but it’s for a good reason. I can trust that God has promised to light my path and show me the way to go if I diligently seek him.